I'm a big fan of HG Wells's WAR OF THE WORLDS. The Orsen Wells reading/hoax is one of my favorite pieces of history. I can't imagine what it would have been like to hear that come over the radio... Anyway, I digress. 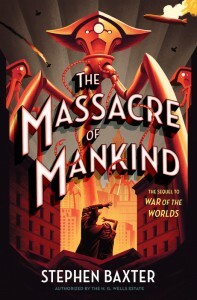 We're not talking about THE WAR OF THE WORLDS, we're talking about its sequel. And, well, it's not very good. In fact it's so bad I've decided not to finish it. Not sure what drove Baxter to continue this storyline with such verbosity, but it doesn't fit. Wells told the first story in half as many pages and here it shows. Long-winded and insufferably lackluster. Don't spoil you memories of the first book/experience by wading into this one. Book provided by the publisher in exchange for my honest review, which you have just read.